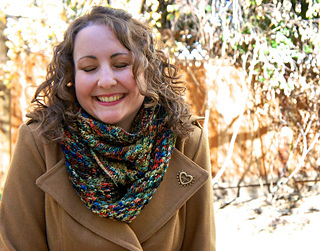 The Denver Cowl was born of a collaboration between Miss Babs and myself. It’s designed to make the most of the always-changing, no-two-alike, fun and funky “Babettes” that Babs dyes. We’ve all been there. 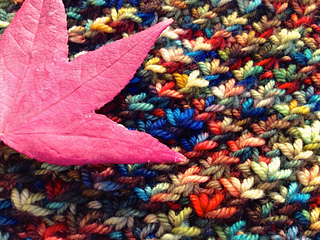 Maybe it’s wool fumes, maybe it’s a color (or three) that calls your name, but suddenly you end up with a big skein of variegated yarn and you have no idea what to do with it. 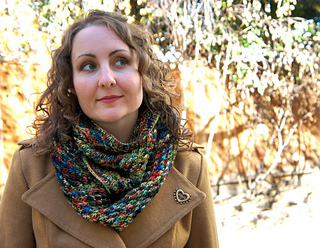 Here’s something to try - a big cozy cowl that you can wear wrapped once or twice. 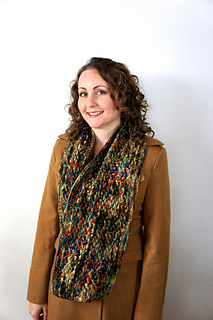 The stitch pattern grabs on to short stretches of color and turns them into little starbursts all over the fabric. The pattern is simple. 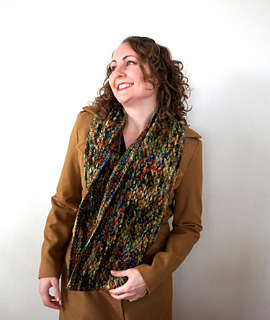 It’s knit in the round on a big circular needle (you’ll have better luck with a 32” or 36” one) in Daisy Stitch with some ribbed borders at top and bottom.